Founded in 1998, the Focus Center Research Program (FCRP), is one of three research program categories of the well known Semiconductor Research Corporation (SRC) [link]. FCRP research is always looking long-term and big-picture, seeking breakthroughs that are “critical to U. S. security and economic competitiveness”. FCRP programs involve 41 universities, 333 faculty and 1215 doctoral graduate students. The Focus Centers themselves are not physical locations, but rather consist of multiple universities which engage the leading experts at the participating institutions. Each Center is managed by Center Director and addresses one of the major technology focus areas of the International Technology Roadmap for Semiconductors (ITRS). The SRC runs 6 “focus centers” (below). All 6 centers believe 3D is important and are working in the area. On Feb 11th the first cross center 3-D workshop was held. 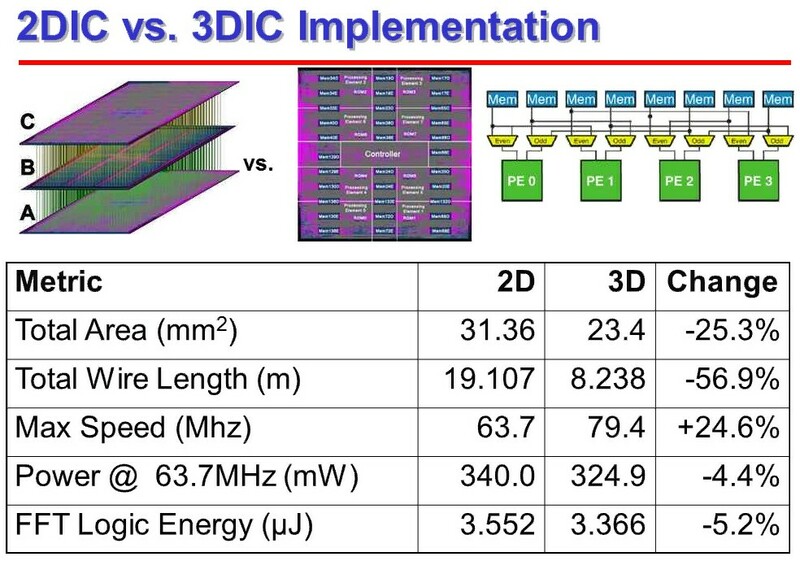 Tanay Karnik of Intel examined 3Dintegration from the perspective of a processor company. 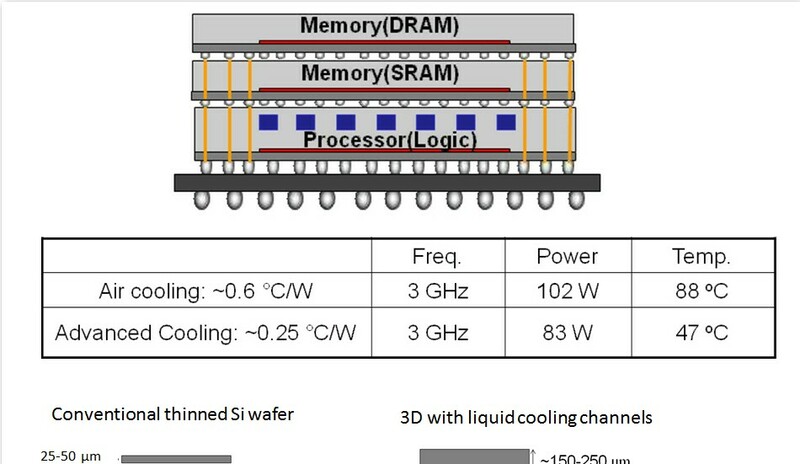 IFTLE has discussed the requirements for low power high bandwidth memory in several recent blogs [ see IFTLE 38, “of memory cubes and Ivy Bridges” and IFTLE 40, “Samsung Wide I/O DRAM for Mobile Productsâ??¦”]. 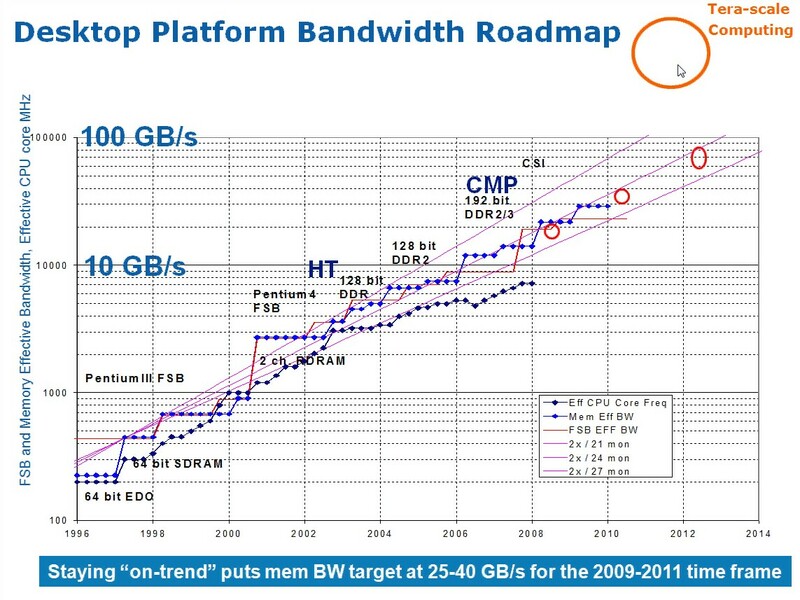 The slide below shows the bandwidth required to stay on the roadmap. 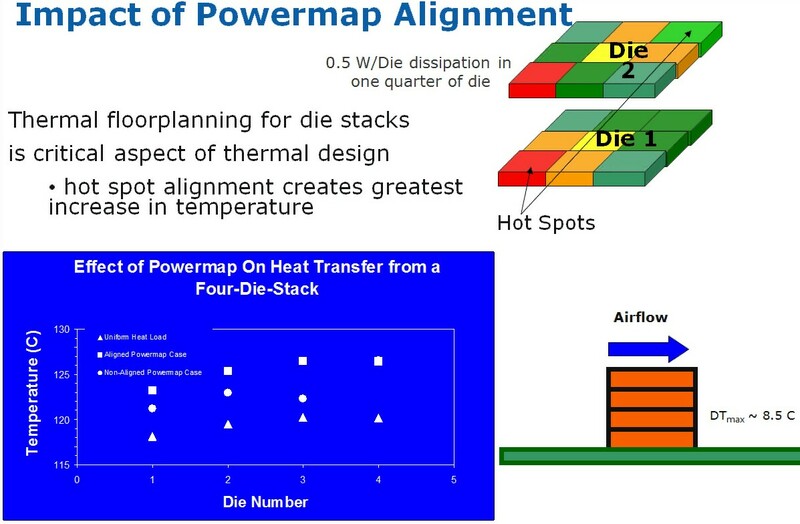 When examining thermal issues Karnik emphasized that thermal floorplanning was necessary to insure that thermal hot spots are not aligned as shown below. 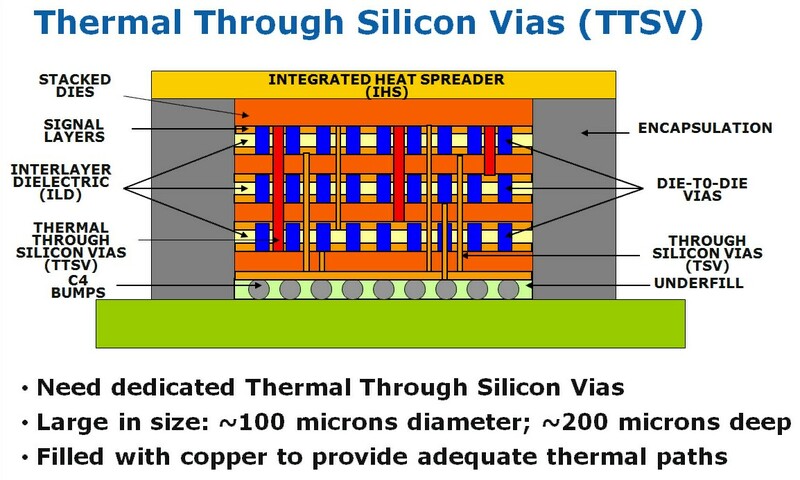 In addition thermal TSV will likely be needed to carry heat directly to the heat spreader as shown below. In agreement with Intels Karnik, Bartley points towards to thermal awareness as a necessary prerequisite for 3D design as shown below. Andrew Kahng of UC San Diego reviewed IRTS technology working groups which are involved with 3D technology. 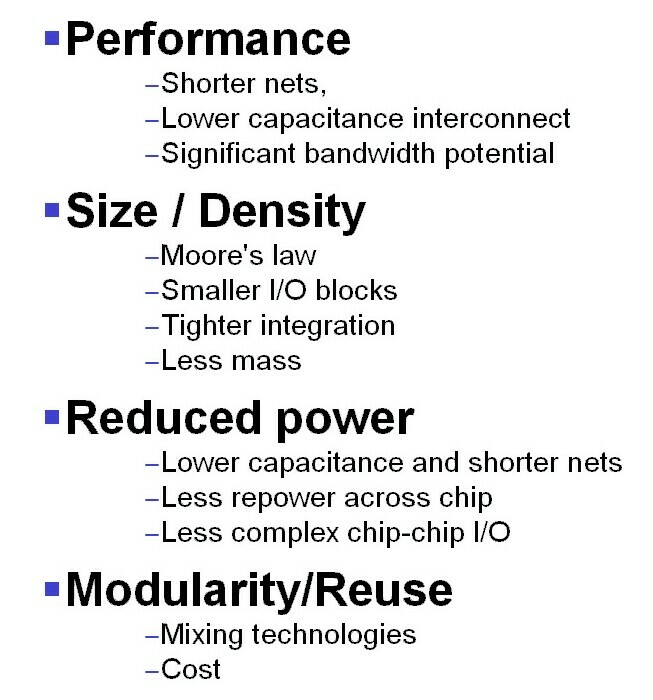 IFTLE has recently reviewed the same material [ see IFTLE 16, "The 2009 ITRS Roadmap.."] As an example of some of the things being looked at Kahng pointed to the prober challenges we are expected to see after 2013. Paul Franzon from North Carolina State discussed he design of 3D systems. Franzon also identified memory on logic as a key driver for TSV based 3D architecture with examples such as high end mobile graphics synthetic aperture radar. When examining the advantages of 2D vs 3D for the synthetic aperture radar application we can see that 3D has significant advantage. Muhannad Bakhir from Ga Tech focused on liquid cooling for high performance 3D systems. While the thermal impact of micro channel cooling can be significant, the space occupied by the liquid cooling channels is not insignificant and will limit the thinness of the strata. 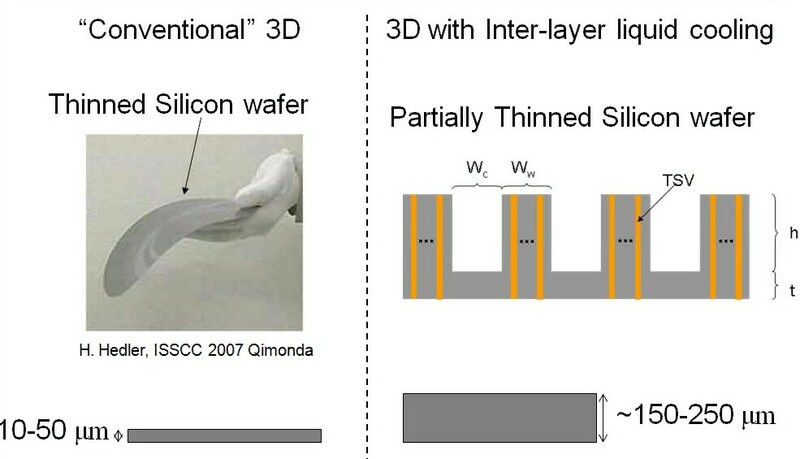 For all the latest information on 3D IC and advanced packaging stay linked to Insights From the Leading Edgeâ??¦â? ?¦.